Increasingly, consumer purchasing habits are shifting towards making purchases on E-commerce platforms, with eMarketer estimating such purchases will double over the next several years and reach 12% of all global trade by 2019. Compare this to Connected Commerce report which has revealed that in 2016,57% of consumers worldwide purchased a product online from outside of their country of origin and it begins to paint a picture of an ever-growing global E-commerce landscape. simplyBrand was built to create a new world for digital commerce wherein brands and consumers are protected from the damaging and lethal effects of counterfeit goods. 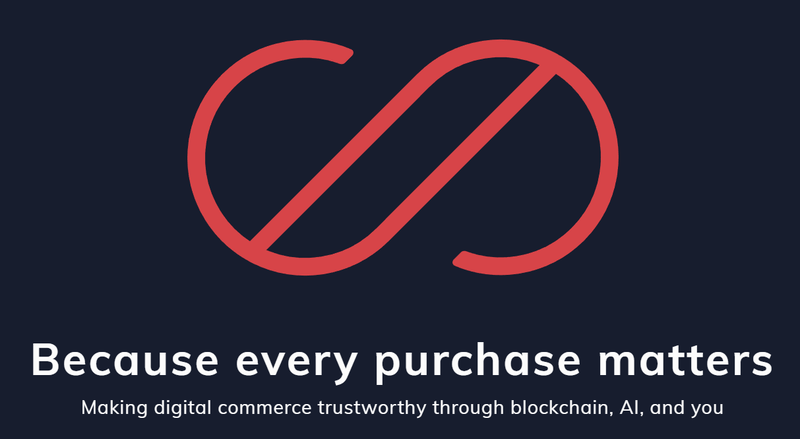 A world where consumers can purchase goods globally without fear of receiving a low quality or harmful product; where brands are able to regain their rightful market shares and no longer have to worry about being tarnished by counterfeit products which have made their way into the hands of loyal consumers. simplyBrand is creating a world of safe and trustworthy digital commerce free from the harm caused by the counterfeiting industry. For the past several years, simplyBrand has united technology with business to help brands protect themselves and their images. Based in Shanghai and assisting a variety of multinational brands, we have witnessed firsthand the damage that counterfeit products cause to consumers and businesses. This damage extends far beyond simple, low-quality goods, but widely effects industries as diverse as aircraft manufacturing and even pharmaceuticals. This is why our experienced tech-savvy team of like-minded professionals decided to unite under the shared belief of ridding the threat of dangerous counterfeit goods from digital commerce by using the resources at our disposal, while also combining the latest technologies to develop the best solution possible. Brands will use the simplyBrand platform to request brand-protection services, Crowdsourced Participants will directly report counterfeit products, or work with the AI to verify E-commerce products and the Enforcement Agencies will use the platform to access lists of verified counterfeit products. In today’s increasingly technological world, E-commerce is becoming more influential to people’s lives, which is also creating new and expanding avenues for counterfeiters to exploit. The simplyBrand platform will combine AI, human ingenuity and blockchain technology which will be used to create an immutable “blacklist” of counterfeit product vendors available, while the tokens within the blockchain will incentivize crowdsourced participants to utilize the simplyBrand platform. The following are the various roles and benefits they will get from being part of the SimplyBrand platform. Brands will directly benefit from the simplyBrand platform by having counterfeit versions of their products quickly identified, verified and removed, helping them to maintain a positive brand image and regain their market share. Counterfeit retailers will also be exposed, giving brands the chance to learn more about the source of counterfeit products. Brands will join the ecosystem by paying a service fee, and by offering products and services as rewards to crowdsourced participants. Brands will give back to the ecosystem by helping to improve the accuracy of the verification process and contribute to whitelisting legitimate retailers. The participants in this system will be the people supporting the verification process; people who are likely fans of specific brands and products, or those who simply wish to make some pocket money. Within the ecosystem, participants will be shown product pages and verify if they are counterfeit or not, helping to improve AI accuracy. They will also be shown two product pictures and will verify the real version, helping to improve image recognition. Finally, they will directly report counterfeit production E-commerceplatforms, helping the AI to collect real samples for further improvement. Enforcement agencies refer to the organizations that specialize in working with E-commerce platforms to remove counterfeit products from E-commerce platforms. 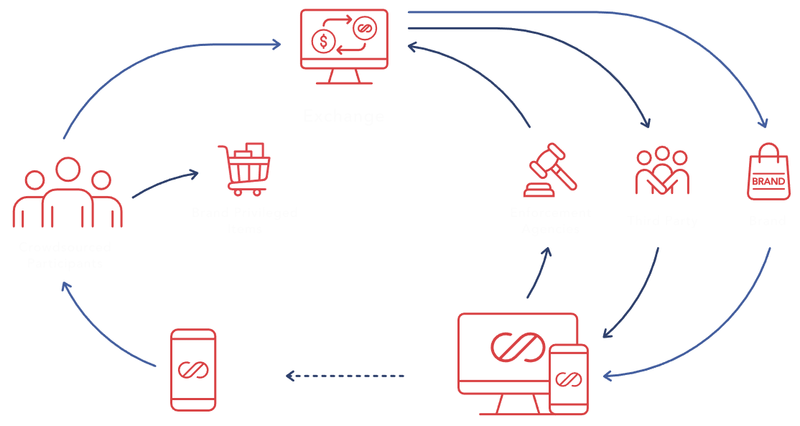 By joining the ecosystem and working within the platform, they will have access to a large amount of counterfeit product info instead of having to find it manually, allowing them to increase their earning potential and prove their effectiveness to brands and potential new clients. The platform will also be available to a variety of third-party organizations, including legal firms and other organizations that wish to do business with brands and/or participate in the ecosystem. These organizations will participate because it improves their access, and subsequent offerings, to a variety of global brands. Many third parties already working with brands will benefit by having access to a system wherein they can find data to help evaluate the risk factors which counterfeiting poses to a brand. 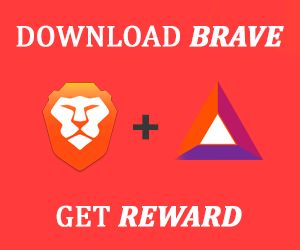 The human layer will receive tokens as rewards and can either use them to purchase brand privileged items on simplyBrand platform or sell them on the exchange. Brands can buy tokens from an exchange, and purchase brand-protection services on simplyBrand platform. Launched in 2017, COBINHOOD is a next-generation cryptocurrency service platform. 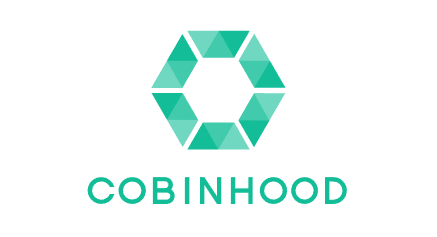 COBINHOOD is home to the world’s first zero-fee, high-frequency cryptocurrency trading platform. COBINHOOD believes the evolution of blockchain technology and a decentralized financial landscape will transform global capital markets and business organizations with long-lasting impact. We offer innovative ICO services, including private placement, marketing, smart contract code review, and token listing. Shortly after its launch, American company 5 Miles successfully raised up to 84,000 Ethers by ICO with the help of our underwriting services. Today, COBINHOOD continuous to provide premium services for various ICO projects across the globe. To stay up to date on simplyBrand news and announcements, subscribe to Medium and Steemit channels, follow on Facebook and Twitter, and join the conversation on Telegram.